Fun fact: Haiji Sakura's art is pretty similar to Rie's art. 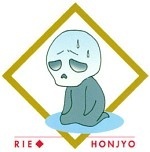 I always enjoyed Honjou-sensei's works! Please add Sekai wa Shippo de Dekiteiru. I love Koi to Kaerou!!! The first work I read of hers was Ikura Nandemo Sukisugiru; some months later I read Love Me Hard. I had to double check that it was the same author who wrote those two, lol.